At its latest meeting, the steering group for “Ny LiU-webb 2015” decided to gradually open up the various entryways. At the same time, the corresponding pages on the old website will be shut down. The first step is to present LiU’s degree programmes in connection with the major programme fairs being held. The main entryways will then follow as sufficient material to fairly reflect the university’s operations becomes available. Information on the programmes is retrieved from the new Bilda programme database. The link between Bilda and the Sitecore web publishing tool is finished; as of this week, the flow has started up in the “sharp” environment. If the transition doesn’t work or maintain sufficiently high quality, the time for opening the new web will be postponed. A gradual transition to the new external Web site will give the Web project time to ensure that everything is functional and that the Web site maintains the quality that was previously decided on. Just now, work is under way on producing a schedule for when the other parts of the operation can be opened up on the new external Web. During a transitional period, visitors will be guided to the old web as needed. At the same time, extra support and training in the Sitecore publishing tool will be provided to the Web editors. Producing content adapted to target audiences has been in progress throughout the year, says Magnus Johansson, head project manager. “It’s important everyone understands that there won’t be room on the new, external liu.se for much of the content found on the LiU web today. 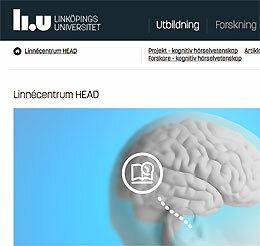 The information aimed primarily at employees and current students will be handled through our internal channels – liu.se/insidan and student.liu.se, or alternately Lisam. Get a sneak preview of the new Web here!